Recently we bought some fresh ginger root and I was about to wrap it in aluminum foil and put it in a zip top bag in the freezer when I found myself wondering how people used to store it before freezers were everywhere. It turns out the answer, as is often the case, is alcohol! Years ago I bought a wonderful reference book called Keeping Food Fresh by Janet Bailey which is basically the ultimate guide to choosing and storing all kinds of food. I’m always going to it to answer questions like these. 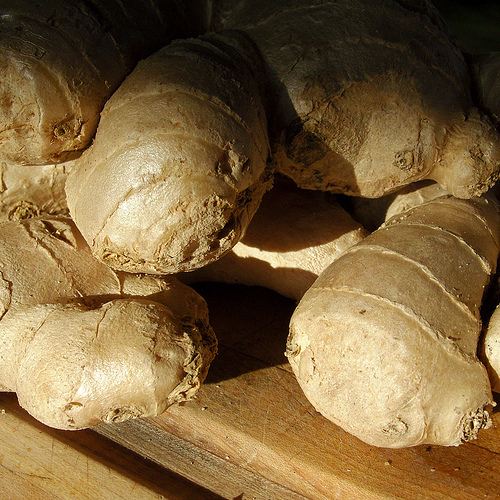 Ms. Bailey gives several ways to store fresh ginger root, including my freezer solution, however she says the most intriguing one she has run across is submerging the whole root in sherry and storing it in the refrigerator. She goes on to suggest uses for the ginger flavored sherry which results from this happy combination, including salad dressing and a little something to liven up your next stir fry. Further research revealed that many kinds of spirits have been used for this purpose, including brandy, vodka, sherry, and sake. It seems that a fairly high alcohol content is required since most sources do not suggest wine. Completely submerging the root (peeled or unpeeled) in distilled spirits or sake (which runs about 18-20% alcohol) is said to preserve it for six months. Ms. Bailey only gives ginger stored in the freezer a life of four weeks, so I had to give this a try. Our ginger had two sections so I cut it apart and stored one the usual way in the freezer and put the other in a recycled mayonnaise jar, covered it with vodka and stashed it in the fridge. Really, I’m guessing that the fridge isn’t strictly necessary, but I have one so why not increase the chances of success? I am most intrigued by the cocktail and cooking possibilities conferred by this method of ginger storage. If I had enough sherry in the house (we’re running low from the holidays) I would have used that instead. I love the idea of throwing a bit of gingery sherry from the jar into a sauce or salad dressing. For now, I will have to be content with thoughts of ginger flavored vodka cocktails. Not a bad trade off I’d say. Will not the ginger take up the alcohol, so you have boozy ginger? Which, I mean, that’s not *in general* a terrible thing, but I can think of cases where you might not want that. I’m not sure if it will absorb the alcohol. Next time I have need for ginger in a dish, I guess I’ll find out. I’m thinking that as long as the ginger gets cooked, the alcohol would evaporate. In the case of Vodka it wouldn’t leave any flavor behind, but using sherry or something else would hopefully leave flavors that would enhance what you are making.